Breast cancer screening is the most reliable way to detect the disease when it’s at an early stage and is most treatable, experts advise. “Today, there is greater awareness of the disease, and breast cancer is being detected earlier through screening,” said Dr. Kathryn Evers, senior radiologist and a professor of diagnostic imaging at Fox Chase Cancer Center in Philadelphia. “Overall, patients are experiencing better outcomes as a result of state-of-the-art treatment options and less extensive surgery,” she added. The reminder to schedule a breast cancer screening test comes during Breast Cancer Awareness Month in October. After skin cancers, breast cancer is the most common cancer among U.S. women, according to the American Cancer Society. The average risk of breast cancer for an American woman is about 12 percent, or a 1 in 8 chance. The chance that a woman will die from breast cancer is 1 in 38 (about 2.6 percent). any change in the size or shape of the breast. “Some women experience one or more symptoms, while others experience none. Let your doctor know if you experience any so he or she can determine the cause,” Evers said. 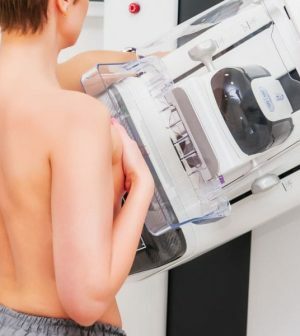 “Regular screenings and mammograms are still the most reliable way to detect breast cancer in its early stages, even before symptoms appear,” she concluded. The U.S. National Cancer Institute has more on breast cancer screening.